Painting my nails is my favourite part of the week. I usually do them around two or three times a week, I curl up on my sofa with all the supplies I could possibly need, put on a good TV drama and take my time creating something that’ll make me feel good. Out of all the pockets on my hanging nail storage unit, the coral/orange pocket is one of the most full. So I grabbed some of my favourites and created a subtle ombré effect, going from darkest to lightest. 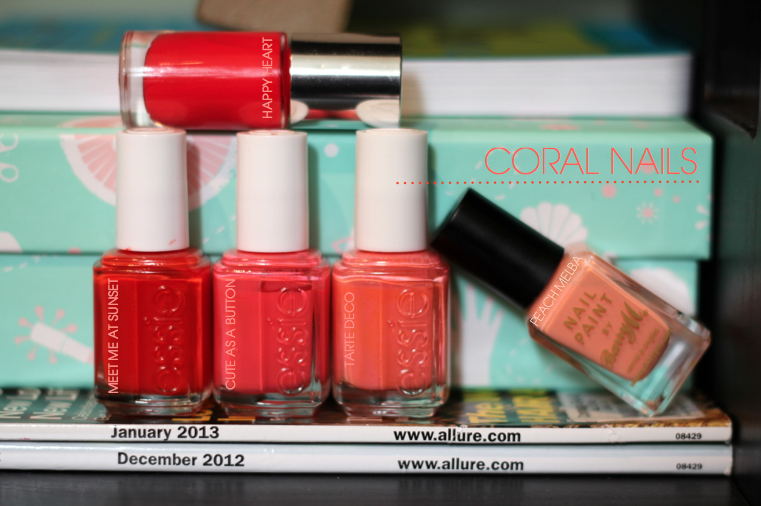 If you asked me what my favourite colour nail polish is, I would never think to say coral, but actually four of the polishes I used here are some of my all time favourite colours. Clinique ‘Happy Heart’ mentioned in this post is the most gorgeous fire cracker red/orange and is very similar to Essie ‘Meet me at sunset’. ‘Cute as a button’ is a pretty pink and ‘Tarte deco’ is a lighter peach version. For the little finger I needed a really light colour so that the overall ombré look would be noticeable, so I used Barry M ‘Peach Melba’ which is the perfect soft peach. What do you think of this nail look? Is it something you’d try yourself?